Club membership is for a jogging year, ending at the Joggers Dinner early Nov. It's the best value!! $20 for an individual, $40 for a family + $5 per timing tag new. Replacement tags $10. New members are welcome and you can download a form here, or at the Hill Run on Saturdays. If you are new, please come early to sort out your membership and tag. 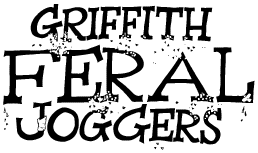 Existing or Past Members of Griffith Joggers now login to the website to check details and update membership. Why? It saves us untold hours of admin. You will be able to check and edit your details, pay your membership fee, individual or family. How? This works for Existing and Active members. Inactive members need to contact us so we can reset your status.